Usually, you can find me out in the woods somewhere with a backpack and hiking boots. But there are occasions when I’m actually not like that. Like when I have to go to conferences. Or when I’m going to visit friends in New York. And when I’m heading to a wedding (because I actually do like to dress up for those, for once!). And for those travel occasions where I’m decked out in dresses and heels, I like to have a bag to reflect what I’m doing. 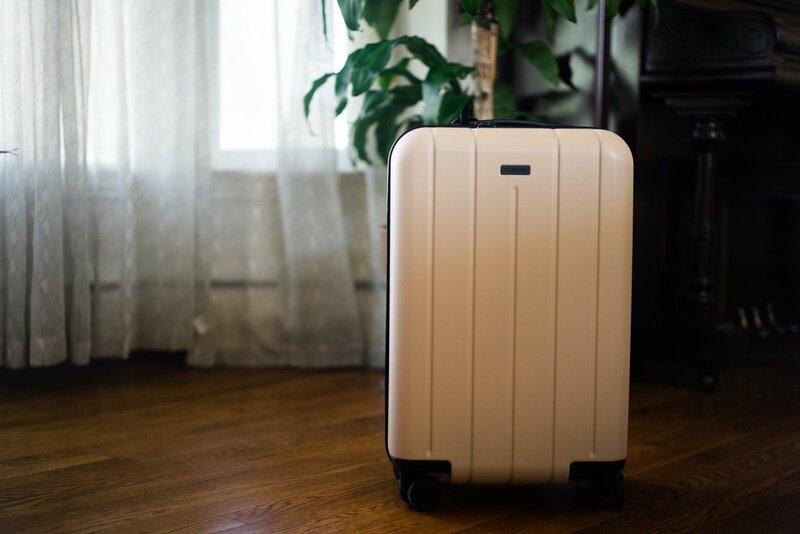 So, when the folks at Chester reached out to me, I happily jumped on the opportunity to check out their Minima carry-on suitcase and see what all the hype is about. Oh, yeah…the hype. Chester’s suitcase has gotten 4.8+ stars pretty much everywhere I researched it online, and people seem to really love it. So, when I finally received mine in the mail a few days ago, I decided to put it to the test. The Chester Minima is a hard shell suitcase that’s designed to work as a carry-on. 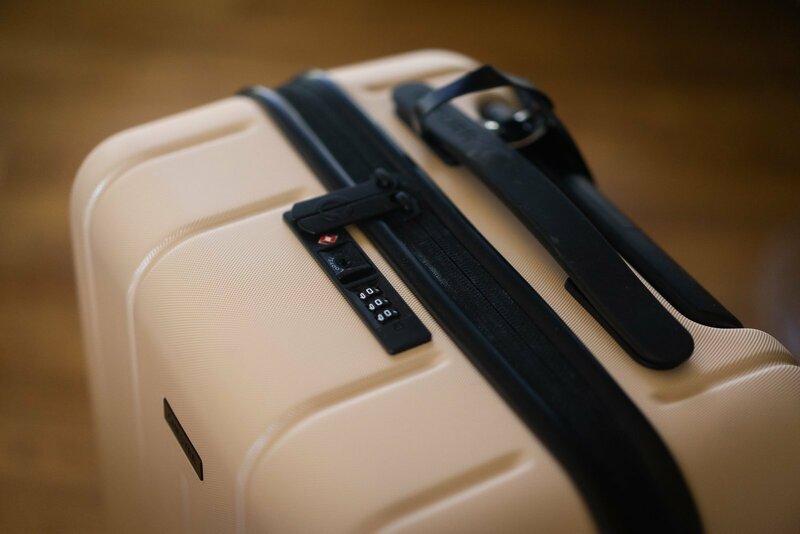 With spinner wheels, an included TSA-approved combination lock, and lots of handles and compartments, it’s a fabulous option for business travelers or weekenders looking for a sturdy, easy to use companion. Even before I received my suitcase in the mail, I was already super excited. Why? Because I got to choose from a selection of 7 different colors, ranging from neutrals to fun pastels. If you’ve ever been on my Instagram, you know I’m OBSESSED with colors, so it was fun to choose one. Ironically enough, I ended up going with the most non-colorful color they offer — a light beige. Upon taking my Chester suitcase out of the box, it felt a little heavier than I was expecting. Instead of being puzzled, I was actually pretty happy about that — I had an ultralight hard shell that was super lightweight, but it broke after a year of use after I checked it in one time. The Chester Minima definitely felt a lot more sturdy. Another thing I want to call attention to is the wheels. Of course, the Minima has spinner wheels, which is great because there’s nothing I hate more than non-spinner wheels on a carry-on suitcase. I mean, I’m constantly moving in all different directions…shouldn’t my suitcase come with me? But the great thing about the Chester Minima’s wheels is that they’re made of durable rubber, rather than flimsy padded plastic. This is awesome. I’ve had WAAAAYYYY too many suitcase wheels break because they’re absolute garbage, and the Chester wheels definitely feel a lot more well-made than that. And lastly, the handle. Whenever I first get a suitcase (this Chester Minima included), I always extend the handle and grab the side handles and wiggle it around, shaking it as if I’d be boarding a plane or taking it off from a baggage ramp. The Minima’s extended handle seemed to hold up to my test — it didn’t budge or become wobbly after I shook it several times. If you haven’t noticed, I’m kind of rough with my travel gear. Almost everything I own seems to break (or tear, or fall off…you get the picture). My gear goes through a lot, between long-term international travel, frequent visits around the USA, and lots of flights all over the place. Of course, it’ll take a few more months to truly test the durability of the Chester Minima, but for now, it feels like a carry-on companion that will last me quite a long time. 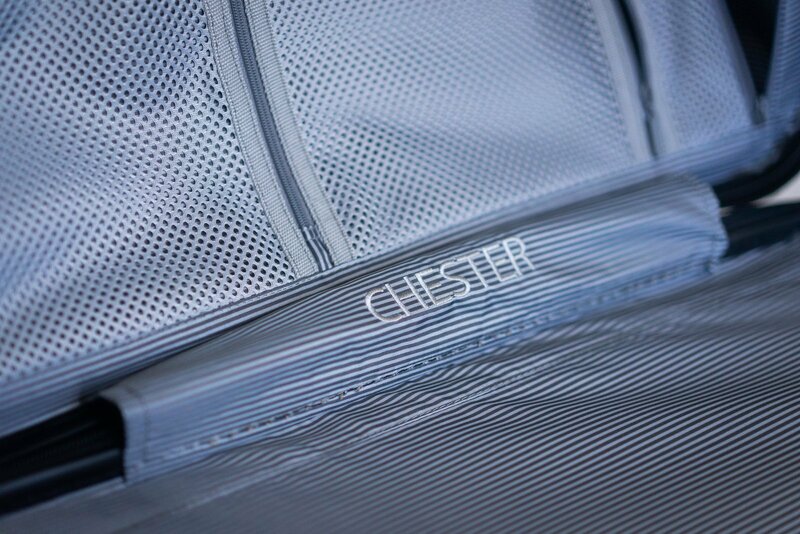 The Chester Minima comes with a variety of really intuitive features: a combination lock embedded into the top of the case, two large, separate compartments to store clothes, shoes, or anything else, lots of zippers and other organizational elements, and of course, a hard shell cover. Hard shell case: The outer shell feels super durable. It’s shiny but it has small dots on it, so it won’t look horrible if it gets slightly scuffed. Spinner wheels: Made of durable plastic with rubber coating, they don’t wobble or spin around on their own, which is pretty awesome considering I hate a) runaway suitcases and b) flimsy wheels. They are what holds up the entire suitcase, after all! External lock: This one is pretty standard for suitcases that have locks. There’s a little booklet inside the suitcase that tells you how to change the combination. It’s also TSA friendly. Extendable handle: Good quality, not wobbly or hard to open. Being an extendable handle on a suitcase is a thankless job. Two external side handles: Also seem to be good quality. I grabbed them and swung the suitcase around (with some stuff inside, too) just to make sure they were durable. No complaints. External zipper: High-quality, not the kind that eats itself and then busts open at the airport right before your flight (because, sadly, that’s happened to me one too many times before…). Luggage tag: A (faux?) leather luggage tag. Nothing special, but also a nice freebie! Striped, synthetic interior material: I really like the material on the inside. I once had one that was made of some kind of cotton blend and that thing got dirty SO fast! With this gray synthetic material, I feel like my suitcase won’t look dirty every time I open it. Two large zippered compartments: Love the organizational aspect of this — I can put clothes in one and shoes/outerwear in the other, or just simply keep my stuff separate. Two extra zippered mesh compartments: Ya know, for toiletries or perfume or whatever. They’re a good size and the zippers feel awesome. One extra large non-mesh zippered compartment: On the bottom half of the bag, there’s a HUGE compartment included for even more organization. Did I mention I love zippered compartments?! One small internal zippered compartment: For hiding valuables and whatnot. I like when suitcases put these in because they’re great for small jewelry or electronic cords. Laundry or shoe bag: Super helpful to have, because let’s be real, it’s nice to be able to separate out the nasty stuff from the clean stuff in your bag. After lots of initial testing, Chester is going to be my carry-on companion, at least for the time being. It’s a little heavier than other hard shell bags I’ve had in the past, but there’s a reason why those bags are now in Kay’s suitcase graveyard. 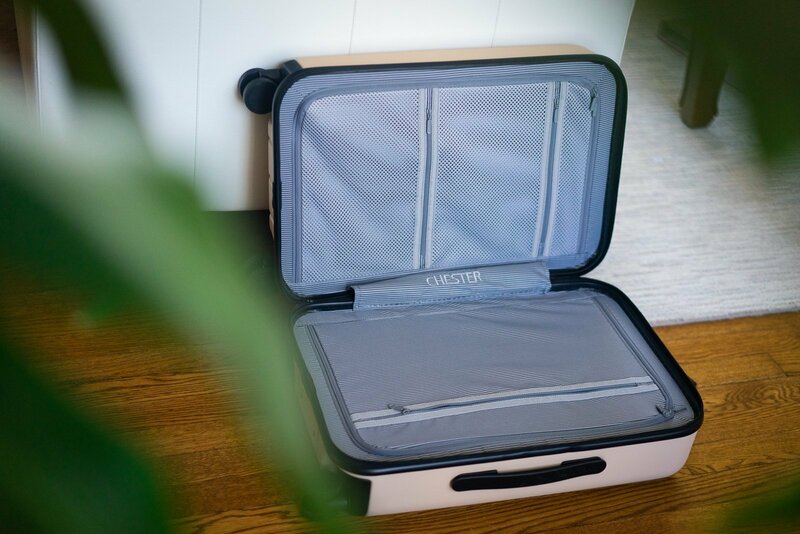 The Chester Minima feels sturdy, durable, and well-organized, which literally erases 99.9% of my travel woes when I’m using a carry-on. I can’t wait to put my Chester suitcase to the test over the coming months to see just how hardy this baby can be! If you’ve read this and are thinking, “where can I get one? !,” you can purchase them (in all 7 lovely colors) from Chester’s website or on Amazon. On their website, you can use the code JETFARER to get 10% off your purchase (yup, that code is for super special Jetfarer readers ONLY!). Chester graciously gifted me this beautiful and sturdy little suitcase, but as always, all opinions, photos, and rough-housing exercises with suitcases are 100%, proudly my own. Did you find this review helpful? Don’t forget to bookmark it or pin it for later!